Coming into this meet there was a tremendous amount of hype bestowed on this affair. When the dust finally settled there were three US #1 marks: boys 60m, boys 200m, and girls 60HH. More importantly than the massively impressive times was the competitive spirit that the athletes brought to town. In a generation where many of today's are often frowned upon for being aloof, it is still refreshing to see greatness within the physical activity realm. One of the first finals of the day- the boys 60 dash- was set up by the prelims. The finish sideline of the track was abuzz when Plainfield North junior superstar Marcellus Moore opened things up in the "easiest" 6.80 on record. 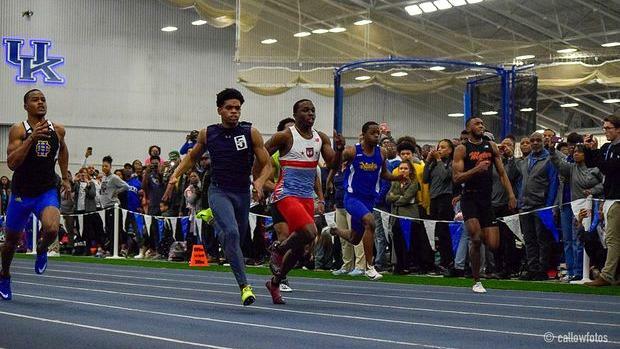 Local star Langston Jackson of Henry Clay HS dropped 6.75 that brought the crowd to a roar. But what happened next was foretelling. McCluer senior Lance Lang lowered the bar to 6.72. Those top three times were then #3, #4, and #5 times from a raw times perspective. These marks are usually enough to win any non-national championship final. Not here. The stage was set several 90 minutes later. "It was crazy, everyone had a mean face... should I be like that," said Lang prior to the record race. "I was so focused that I still had my earplugs in," he added. The starter's gun went off and half of the field including Lang had the jump on Moore. Lang separated from the massive group except for Moore who began accelerating and closing the gap. Moore appeared to get the nod but it was too late. Lang had won in a BIG personal best and now meet and field house record US#1 6.62. He broke national record holder, Casey Combest of Owensboro, KY meet time that stood for 20 years at 6.70. Moore also took down the ancient time with his personal best and US#3 6.65. Four of the top five finishers would finish in the top five national leaderboards.